Ahead of Star Wars Celebration Orlandao this coming weekend, there’s some truly tantalizing news beginning to seep out of the Star Wars universe – and no, it doesn’t involve The Last Jedi on this particular occasion. Rather, Star Wars News Net has unearthed a report today regarding the gaming corner of Disney’s galaxy far, far away and, specifically, Star Wars: Knights Of The Old Republic. 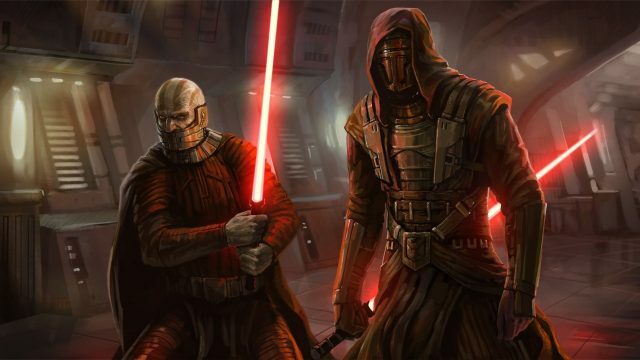 It’s going on 14 years since EA and BioWare first launched the cult RPG, and in those intervening years we’ve seen a further two additions to the KOTOR universe – namely Star Wars: Knights of the Old Republic II: The Sith Lords and MMO spinoff, Star Wars: The Old Republic. I’ve learned now that [BioWare Austin is] pretty much now exclusively working on Star Wars games and they’re going to be doing that for the indefinite future. What they’re currently working on right now—and I have this on good authority—is a sort of remake/revival of Knights of the Old Republic. I don’t know when this is set to come out, but it has been in development for a little while now. I don’t really know how that game [will] end up. I’ve heard that it isn’t exactly a remake anymore, but it started as a remake/revival. Now it’s kind of going from that blueprint in sort of its own original thing. I guess we’ll see what that turns out to be, but they are prototyping it right now. Disney’s decision to overhaul the Star Wars Expanded Universe is the key reason behind this, though it seems the Mouse House is ready to welcome those iconic Knights back in from the cold. I think this is sort of like wiping the slate clean… I think this is going to embrace the new Star Wars universe lore because Knights of the Old Republic was sort of just pushed into the expanded universe, the Legends canon of Star Wars. Beyond that, little is known about the project itself. The fact that Robertson claims this new version of Star Wars: Knights Of The Old Republic has been in development for a “little while” leads us to believe that it could be showcased either at E3 2017 or the aforementioned SWCO. Thanks to the blistering success of The Force Awakens and Rogue One, not to mention the pent-up demand for The Last Jedi, the Star Wars pandemonium is palpable, so we wouldn’t be too surprised if these allegations turn out to be true.